In my MSc-thesis research I tested novel terroir models on Farmhouse cheese (Boerenkaas) originating from the Green Heart area in the Netherlands, also known as the traditional farmhouse cheese area surrounding cities like Gouda and Leiden historically linked to the traditional Gouda type and Leiden type of Famhouse cheese. The latter or Boeren Leidsekaas has been certified a product with a protected designation of origin or PDO by the EU-Quality regulations in geographical indications and traditional specialities in 1997. It has a strict demarcation of the production area or terroir and a strict code of practice. 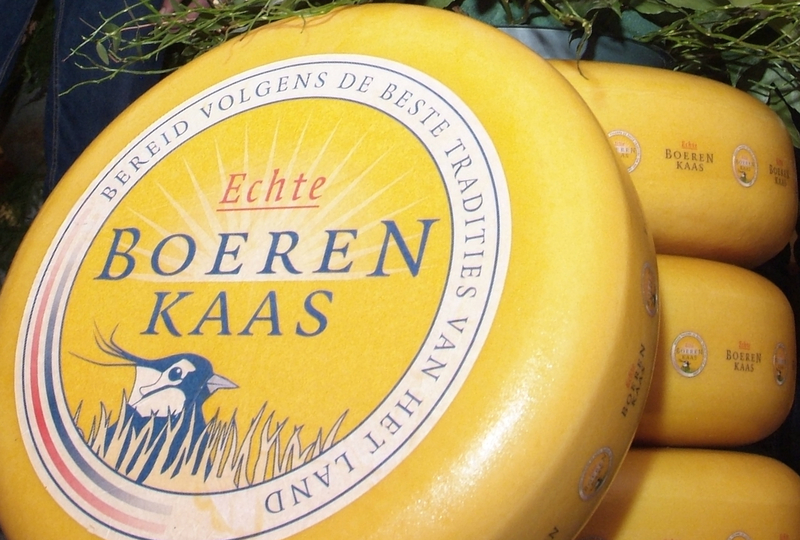 In 2007 the Boeren Goudsekaas was certified as a Traditional Speciality Guaranteed or TSG, that is less strict then a PDO: it guarantees only some traditional product methods. Basically that is made of raw milk and that while processing it should not be heated above 40°C or pasteurized. Unlike PDO the TSG has no regulations with regard to cattle breed, cattle feed or cheese manufacturing, as e.g. the Comte has to some extend. And a TSG has no geographical demarcation and can thus be produced at any farm. The meso-terroir and micro-terroir models are based on the most regulated terroir concept in viticulture and the New World trademarked terroir concept. Samples of twenty-four Gouda Farmhouse cheeses with EU Traditional Specialty Guaranteed (TSG) protection were collected from dairy farms located in the Green Heart area. The samples were collected during farm visits, and interviews were conducted on the characteristics of farm and cheese making practices. Subsequently physical, chemical and sensory aspects of the Gouda Farmhouse cheese samples were analysed to establish the quality characteristics of each sample and to explore whether communalities in quality characterics could be attributed to the Green heart area (macro-terroir) or to sub-areas (meso-terroir). Or whether these can only be explained for at farm level (micro-terroir) and in that case do reflect the diversity in farming practices and cheese making practices at the farms or, more analytically speaking, are the expression of craftmanship in coordinating of all these practices. The aroma profile was analysed by Proton Transfer Reaction Mass Spectrometry (PTR-MS), the mechanical properties by uniaxial compression and texture profile analysis (TPA) and descriptive sensory analysis (QDA). The Green Heart was subdivided into three meso-terroirs defined by geographic and historical perspectives. Cheeses from the North were the most homogeneous for the PTR-MS data, whereas mechanical properties and QDA did not differ between meso-terroirs. The variance was statistically analysed for communalities or patterns. One-way ANOVA test resulted in higher variance within each meso-terroir than between meso-terroir. This indicated that distinct attributes must be linked to farms (micro-terroir) instead of meso-terroirs. An optimized micro-terroir model was then applied on unique characteristics of individual farms. In effect this excplored the factor craftsmanship as essential tool for value creation. Identical farms were grouped into four categories based on factors contributing the most for quality; soil type, cattle breed and type of starter culture. One-way ANOVA showed higher variance within groups than between groups, indicating indeed unique attributes at farm level. The results thus put forward the authority of the micro-terroir model, since identical farms were giving different cheeses, in indication for craftsmanship as the main explanatory factor for diversity in quality characteristics. Moreover the large diversity of attributes from multiple analyses pointed out that there is a lack of communality at the level of the Green Heart area and no ground for a macro-terroir and that the wide range of typicity is related to individual farms or micro-terroir. These outcomes indicate that wide range of diversity and farm level and lack of common typicity at the Green Heart area or sub areas might have to do with current, loose, TSG regulations. This entry was posted in Agriculture, Food, RSO-student and tagged boerenkaas, EU Quality schemes, Farmhouse cheese, Groene Hart Streekproducten, terroir, TSG by RSO-Students. Bookmark the permalink.